William Wordsworth (1908-1988) in his large and varied output embraces many forms, including orchestral, chamber and instrumental music, and songs. His scores are consummately well-crafted and display a rugged individuality. There are no sensational tricks, no compromises to fashion and his is generally a quieter, more contemplative voice than that of his contemporaries. Various influences such as Sibelius, Bart�k, Nielsen and, to a lesser extent, Bax and Vaughan Williams may be detected fleetingly in some of his writing, but he went his own way and the best of his music is passionate, tough, direct and sincere. 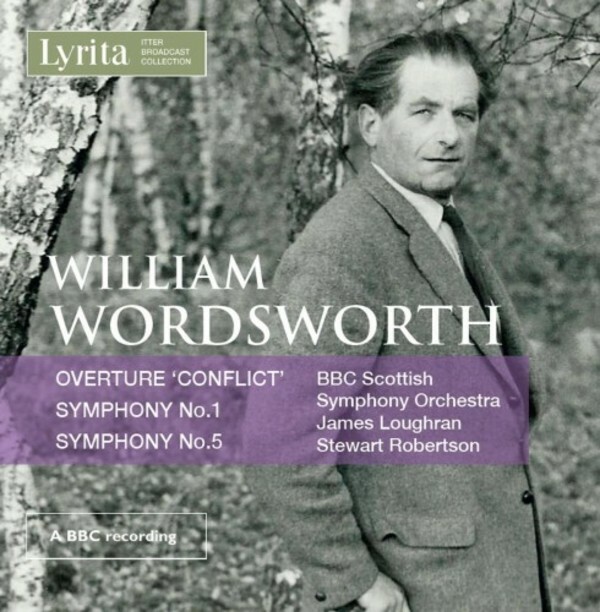 Wordsworth�s Symphony no.1 (1944) has been broadcast on a couple of occasions, but has not yet received a public performance. The Fifth Symphony (1960) is a riot of colour and seemingly unstoppable invention. Representing the composer at the very peak of his powers, it ranks as one of his most life-affirming utterances.